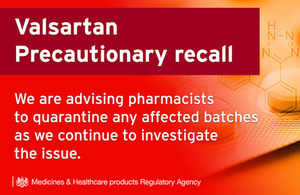 UK pharmacies are assisting with the precautionary recall of Valsartan medication. The Medicines and Healthcare products Regulatory Agency (MHRA) are undertaking a pharmacy level recall of all affected batches of Valsartan containing medicines made by Mylan and Teva as a precautionary measure. This follows an earlier pharmacy level recall in July, when MHRA recalled affected batches of valsartan containing medicines from Dexcel and Actavis (now Accord), also to pharmacy level. That recall occurred across Europe, following information that an impurity, N-nitrosodimethylamine (NDMA) was identified as part of the manufacturing process in a valsartan active substance manufactured at one facility based in China. During the course of the investigation into NDMA, another impurity, N-nitrosodiethylamine (NDEA), was discovered in valsartan drug substance. MHRA, together with other EU regulators, are continuing to investigate other sartan products which share a similar chemical structure to valsartan. At present there is no evidence that this impurity has caused any harm to patients. This recall is being undertaken as a precautionary measure to prevent further exposure to this impurity in the affected medicines whilst the investigation is ongoing. Due to the risk associated with suddenly stopping high blood pressure medication, people are therefore advised not to stop any treatments without consulting their doctor or pharmacist. We are working closely with other EU member states, the European Medicines Agency (EMA) and the European Directorate for the Quality of Medicines (EDQM) to ensure a thorough investigation and we will consider the impact in the UK and what actions may be necessary.